Modern woman juggles between home and work and in this process she completely forgets to look her best. But worry no more ladies, Maybelline Colossal Kajal has arrived right in time to give your eyes that perfect smudge free look. Look your best while nourishing your eyes with the goodness of vitamin E.
A perfect jet black stroke of the Colossal Kajal to enhance the beauty of your eyes. An all easy to apply roll on pen kajal to avoid the hassle of applying it. Anti allergic and enriched with Vitamin E.
Long lasting 12 hour smudge free formula to avoid the pain of reapplying it. Total time saver, easy to apply and easy to remove. Eye makeup is easy, quick and perfect. 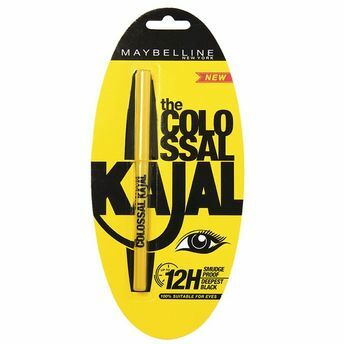 Maybelline Colossal Kajal is a dark black kajal made for the women on the move. Explore the entire range of Kajal available on Nykaa. Shop more Maybelline New York products here.You can browse through the complete world of Maybelline New York Kajal .Alternatively, you can also find many more products from the Maybelline New York The Colossal Kajal 12 Hour Smudge Free range.